I just bought some Peerless watercolors and I LOVE them! You can get really vibrant colors but today a went for a muted palette, and I only used two colors. My inspiration was pixel art, so that was what I wanted to replicate for my background. I cut the word die two times and adhered them slightly offset, and then adhered the wood stars. I asked my husband if he liked this card, he is a honest critic and said he didn’t like it at all. He thought that the card would look better if the squares was exactly the same size, I tried to explain how watercolor works and that I wanted a loose effect but he still didn’t like it. I kind of like it so I thought I should share it with you anyway. What do you guys think? Would this card look better if the squares where exactly the same size? As always, thanks for stopping by, see you soon and take care! 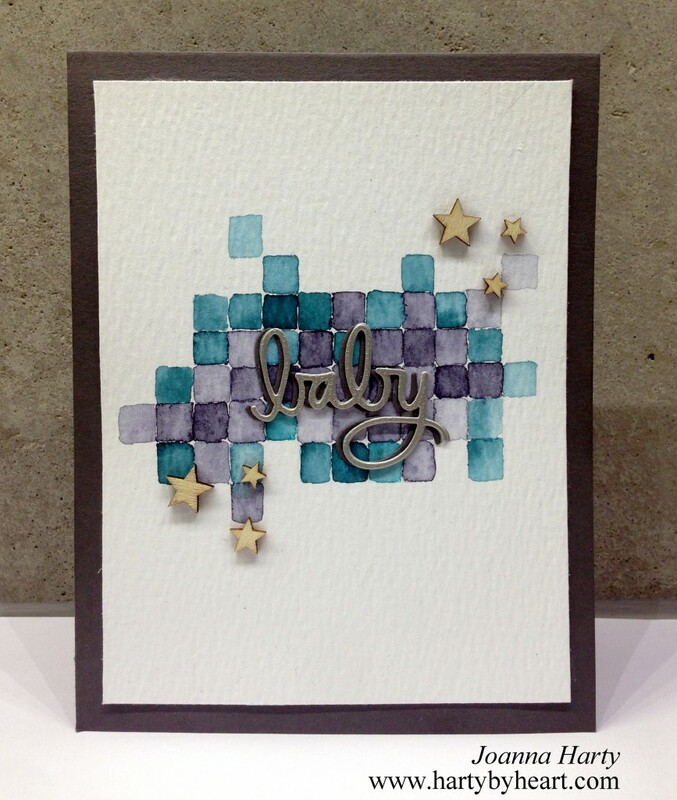 This entry was posted in Baby cards and tagged baby, simon says stamp, watercolor on February 17, 2015 by Joanna Harty. I LOVE your card – my husband doesn’t always love the cards I make either – tastes differ. But ths card is so neat! I also love your little wooden stars – fabulous all in all! Thanks for linking up with us at ATSM! I LOVE your card – my husband doesn’t always love the cards I make either – tastes differ. But this card is so neat! I also love your little wooden stars – fabulous all in all! Thanks for linking up with us at ATSM! I think the card looks great just the way it is. I am going to make a background just like it in the future. Thanks for sharing! Thanks you so much Tracy! I’m happy that I could inspire! I love your card just like it is. Husbands often don’t appreciate that hand made “art” is better if it’s not exactly symmetrical as it shows it’s actually been created by hand. Beautiful water colored background and I love how you created the shadow for your sentiment! Stunning card, Joanna! Thanks for your sweet comment Barb! I love the softness of your watercolor background. Thanks for joining us at 613 Avenue Create this week and I hope you’ll join us again soon. Thanks Jamie! I’m happy to hear that you like it! Ofcourse I don’t mind if you pinned it, I use pintrest a lot my self, love all the inspiration! Jag tycker att det var jättefint!! I think it’s gorgeous! And I DO know how hard that must have been since I’ve been sitting here looking and trying to wrap my head around it! That must have taken some time and patience! And my husband doesn’t like everything I do either. Usually it’s something I really like or think is particularly “artsy” that he doesn’t care for. A simple man with simple tastes. And I often like that Clean & Simple look too, but there is all kinds of room for other stuff that I love. Really nice work! Tack Laura! Glad att du gillade det! Oh, Tack Laura! 🙂 Jag ska genast säga till honom! Hahahaha! I would say your husband probably doesn’t have an eye for art. This is a fabulous card – very clever. Thanks Jenny! I’m happy you like it! I completely disagree your husband. I totally loved those watercoloured squares. 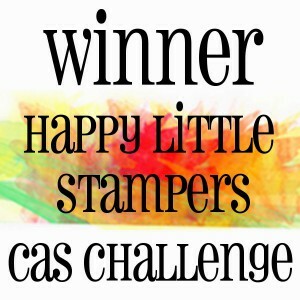 Beautiful card.Thanks for joining us at CAS-ual Friday´s challenge. I totally disagree with hubby – this card is gorgeous! 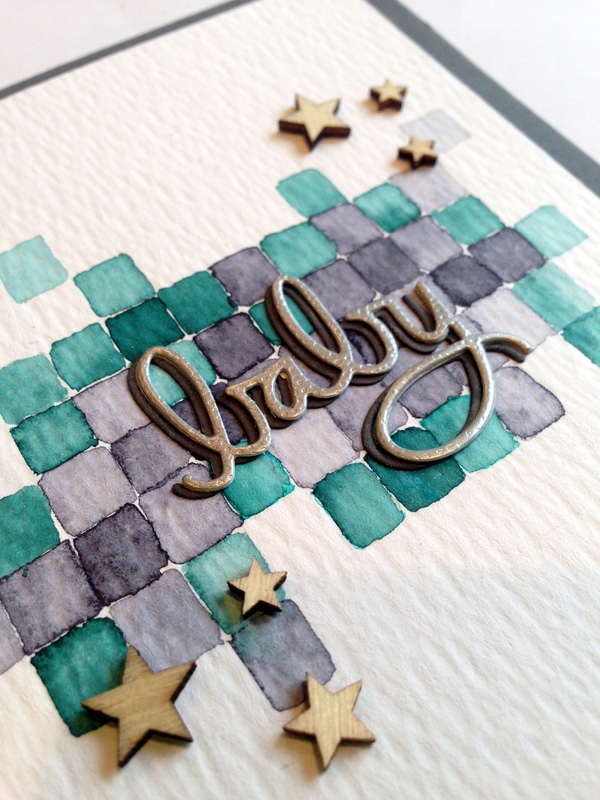 The loose watercolor effect and soft edges make it perfect for a baby card. 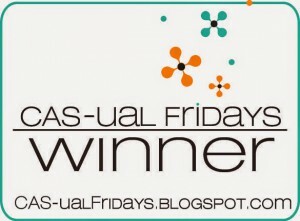 Big congrats on your well deserved win at CAS-ual Fridays! Thanks for your sweet words Jen! 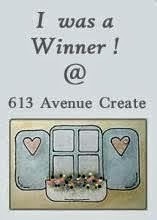 Congrats on your win, this card is fabulous Joanna! So sweet of you Hannelie! Haha! Ja, det kommer det bli! 🙂 Tack Kia! I love this card! I wouldn’t change anything about it. It works! So glad you won!! Well done.